February 14 a day to share love, well it could be shared with a spouse, child, pet .... really anyone that means something to you. I think it shouldn't take a day to make someone show you that you love them it should happen all the time. But as you well know sometimes life can get in the way of the important things, so it's great to have a day like Valentine's to get people to show the love and meaning that they have for someone they love. I got a bouquet of pink and red roses the other day from my husband, I got them early. He's never really been one to do something cause he has to like buying flowers on Valentines day. So he bought them and surprised me cause he likes me not expecting things.... More like a surprise. I love that about him. It's nice to feel special. Here is a flower out of a bouquet of flowers that my husband bought me. I'm sharing this flower with you! Right now Whimsy has a new challenge for the month of February it's add something metal, you should hop over and check out the wonderful creations that the design team has created . ( Click here) Then you could enter your creation for a chance to win some digital images. Like the fantastic one I used on my card that is below. Now here is my Valentines day inspiration card. I made this card for my daughter. 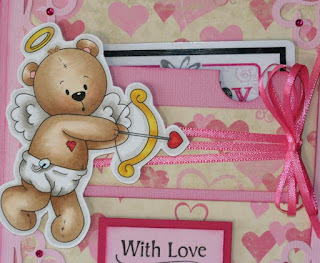 I used a super cute digi stamp from Whimsy Stamps called Little Cupid Bear. This image is from Stampart design. I used alot of pink, girly colors and some bling of course. And a look at that super cute image all colored. 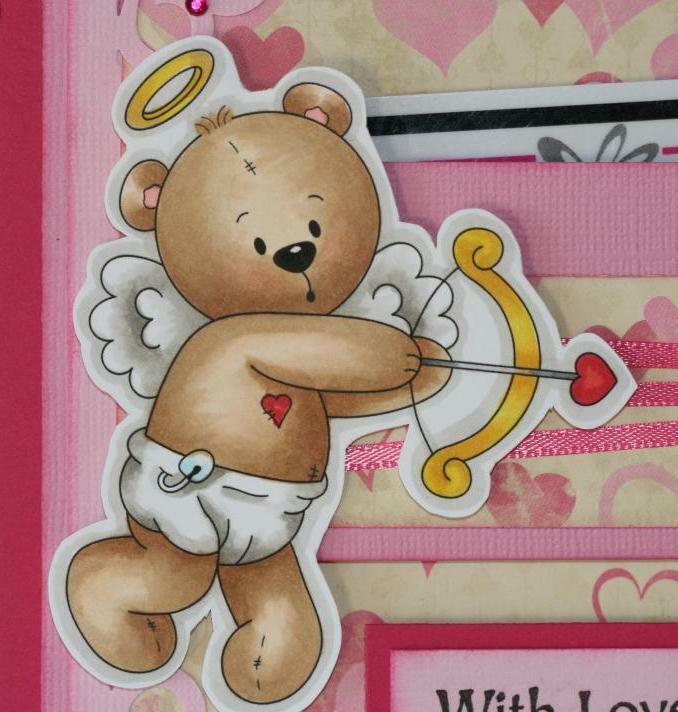 Supplies: Little Cupid Bear image from Whimsy Stamps, copic markers, Bo Bunny patterned paper, Bazzill cardstock, Ek Corner punch, Kanban with love stamp, Kaiser craft bling, Offray ribbon. 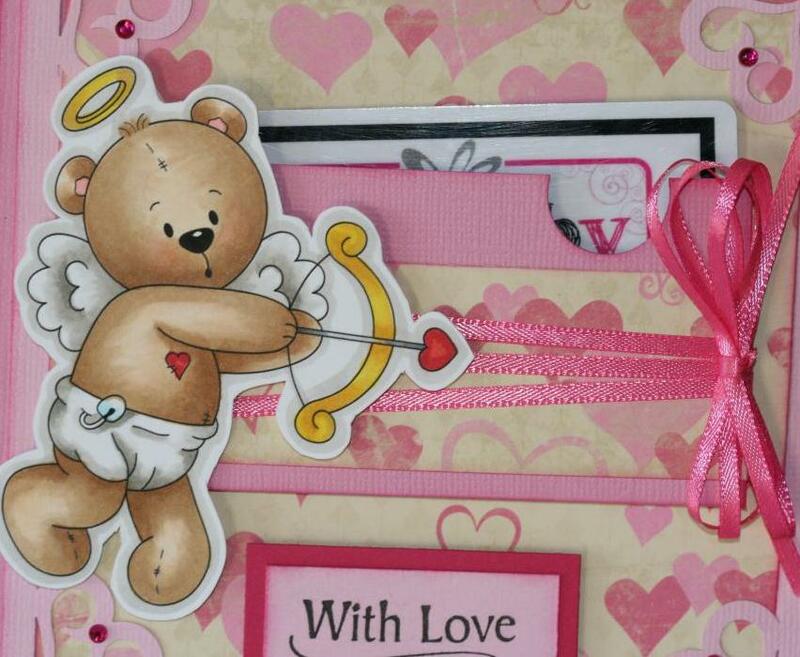 Super cute, I bet she loved it and the gift card too...very pretty, and love the image! Nicely done!